Sprawling crime scene on Benner Street in Wissinoming. 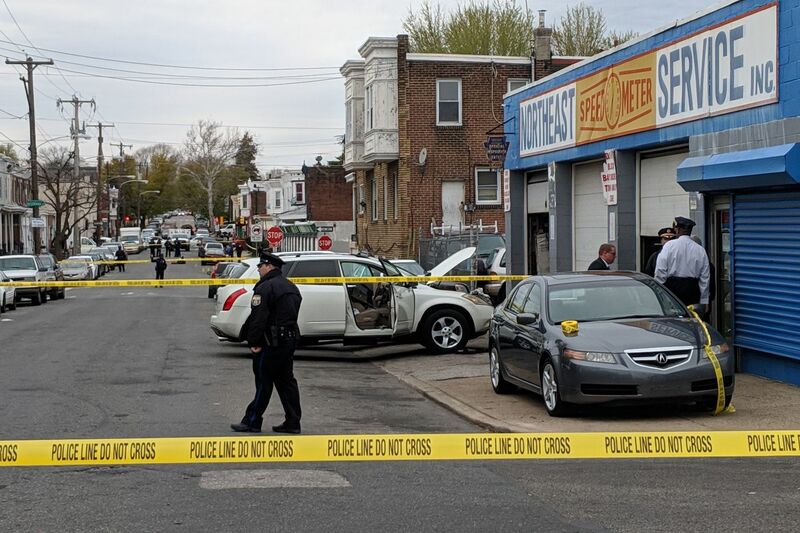 Three people were killed in less than three hours in separate shootings Thursday afternoon, including the 56-year-old owner of a Wissinoming auto-repair shop who got caught in a gun battle, Philadelphia police said. Shortly after 3:15 p.m., the shop owner, Michael Gleba, of Bensalem was hit by several bullets just outside his business, Northeast Speedometer Service Inc., at Benner and Edmund Streets. Responding officers from the 15th District rushed him to Jefferson Torresdale Hospital, where he was pronounced dead at 3:37. The crime scene spanned several blocks on Benner. A cluster of shell casings was marked for evidence more than a block away, near Hegerman Street. A white Nissan Murano was parked in front of one of the shop’s bay doors with a large blood-stained area next to the vehicle. The hood was propped up and the doors were open as police investigated nearby. Monty Gerome, 59, a former neighborhood resident and customer, said Gleba had been a fixture in the community for a quarter-century. Gerome said Gleba always tried to give a break to customers who needed help. Also in Wissinoming, a 23-year-old man was shot in the head inside a corner store in the 5500 block of Torresdale Avenue. That victim, identified as Izeem Hunter of the 2100 block of Anchor Street, was transported by police to Jefferson Torresdale, where he was pronounced dead at 5:02 p.m.
About 4:50 p.m., a 29-year-old man was shot several times outside in the 800 block of West Somerset Street in Fairhill. Police took him to Temple University Hospital, where he was pronounced dead at 5:08 p.m. Police identified him Friday morning as Raymond Grimes of the 3100 block of Memphis Street. No arrests were reported in the three cases as of Friday morning.